Bodybuilders are always afraid from injury and muscle loss, and try to prepare in advance for everything that has to potential to ruin their precious muscle gains. Which is exactly why most of them hate running and would rather do yoga than mercilessly pound the pavement, as they are well aware that running can burn up muscle. Besides, their bodies are carrying 30-40 extra pounds of muscle, which can put too much wear and tear on their joints if they run regularly. But there’s another great fact about running – it’s one of the best ways to get maximum benefits from your cardio. When done right, it’s safe, natural and actually beats every other type of cardio in terms of fat burning, without the unwanted muscle loss. And if you love to lift and love to run, you should know that these two are not mutually exclusive – we can help you get the best of both worlds and get both huge and ripper! 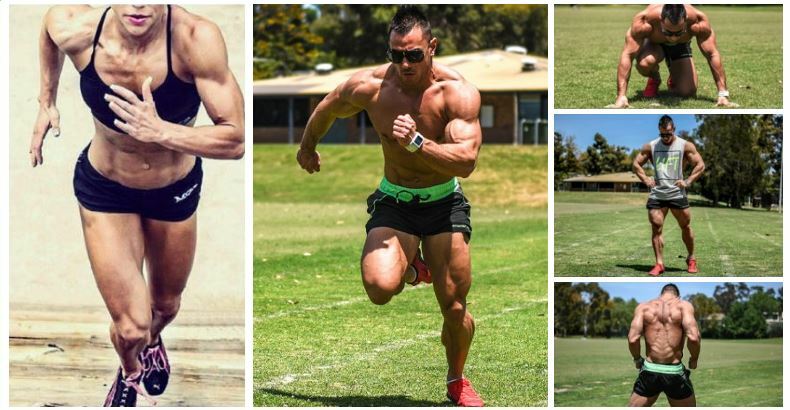 When was the last time you saw a massively muscular man jogging on the street? Yeah, that’s right. You can spot lots of them in any gym, however, sweating over the elliptical machine or walking at 3.5 miles per hour on the treadmill at a three-degree incline. Yet, some athletes, like professional trainer and bodybuilder Kris Gethin, according to whom every lifter who wants to get super lean should incorporate running in his program. Here are three basic tips to help you begin. • Utilize Primal Running Form – To decrease the stress placed on your joints and connective tissues while running, learn “soft” running. This is a technique where you land gently on the forefoot with a bent leg, which imitates the barefoot-running style of our ancient ancestors. • Do Low-Heart-Rate Training – Perform low-heart-rate cardio sessions to reap the extra benefits: the low heart rate will encourage your organism utilize mostly fat as fuel. Use a periodization program and try to slowly increase the pace and get faster over time, maintaining the same heart rate. • Do Sprints – The best time for sprints is after a leg workout (to really exhaust your leg muscles). As a short, high-intensity activity, it will help you avoid undue joint stress and boost the anabolic effect of your strength training session. In addition, you will prolong the calorie-burning window up to 48 hours. • Better Gym Performance – Besides blasting your remaining pockets of fat, running regularly will greatly boost your endurance. And regardless of how strong your muscles are, if you lack endurance, you won’t be able to get the most out of your training program. By increasing your lung capacity and cardiovascular health, you will be able to unlock a whole new level of your strength training and make some deeper gains. You can also use running for recovery between sets while using high rep ranges to hit large muscle groups – this will improve your recovery and speed up the detoxification of the entire body. • Improved Health – Countless studies have shown that endurance running can protect the health of the heart, lungs and gut while keeping blood pressure normal and lowering cholesterol levels. Running can also improve your sleep and cognitive functioning! The main thing about running is that it makes your heart beat faster and harder, thereby demanding your body to do maintenance on your circulatory system. In the long run, this will positively reflect on your energy levels, mental clarity and overall health. From a bodybuilding stand point, running is desirable because it increases blood circulation to the muscles, which means your muscle cells will be able to receive better oxygenation and nutrient delivery. Still Worried About Muscle Loss? Don’t be, because muscle tissue simply cannot disappear as fast as some fitness fear-mongers would have you believe. There are many, many bodybuilders who are living proof that weight training and running can, and in fact should be done in the same time. And with the right regimen, you won’t have to fear muscle loss at all. This would be an issue only if you do high-volume endurance running four times per week while being on a low-calorie, low-protein diet. But if you make sure to keep your diet in check and give your body enough time to recover after each training session, you too can join the “lucky ones” because you will virtually have it all. Increased muscle protein synthesis, check. Incredibly ripped musculature, check. Optimal health, double check! Lots of protein, lots of complex carbs and moderate amount of dietary fat – that’s it. Junk food, of course, is off the limits, and cheat days are not recommended, unless you’re sure you have the willpower to keep them infrequent. Keep your meal frequency high by eating 5-6 solid meals every day and a couple of protein shakes throughout the day, especially after working out and before going to bed. For the post-work shake, use whey protein powder, as this fast-digesting protein will help you accelerate recovery and stop catabolism, but take casein protein before bed because it absorbs much slower and will therefore keep your muscles from starving during the night. Now Go and Do It Right! As with any other activity, it’s not enough to run – you must do it correctly. As we mentioned above, you need to learn some “soft running” techniques and use a forefoot or mid-foot strike instead of landing on your heels to eliminate excessive stress on your joints and tendons. You can also dedicate more training time to building greater hip flexor strength and flexibility, as this will help you run more efficiently and lessen the impact on your knees and calves. Also, remember to avoid excessive arm movement and maintain a proper posture. Form is essential to effective training and injury prevention, so focus on priming your body for the physical effort required.